The Company Man Expansion for Deniable Asset is in its first stage of review. I have also begun work on a Sci-Fi setting: Alpha Star. I wanted to combine character types from Sci-Fi RPG games I have enjoyed over the years like SLA and Shadowrun, and wonderful Sci-Fi dramas such as Battlestar Galactica, Star Wars, and Star Trek. Alpha Star is just coming together but the backstory is this: somewhere in the future Earth’s sun is due to suffer Core Hydrogen Exhaustion and Earth will be uninhabitable. This occurs billions of years too early. No one knows why: yet. The people of Earth are no where near discovering light speed or anyway of traveling to other star systems. The answer is to send out colony ships, with colonists in hyper-sleep, and hope that one day they will find a new place to call home. Scientists are sent along, working in small teams, hoping to eventually make scientific discoveries. As they reach old age, a new team is woken up to continue the work. Power of 12 Role-playing System – What is it? Just put this on my randomencounters.net site. Thought I’d share it in the blog. The Power of 12 Role-playing System is a living creature as much as a game system. It is designed to encourage role-play and fun. It expands and contracts as you see fit. The Power of 12 Role-playing System relies on four basic stats. In each book I call them something different, something that relates to the genre: “Foci” for Of Gods and Relics, “Modus Operandi” for Deniable Asset. Really, they are stats. But I don’t call them stats. “Stats” is a word that carries specific meaning in our hobby. I did not want stats in my game. I wanted empowering descriptors that, each time you looked at your character sheet, you saw an answer to the desperate situation at hand. I also chose the 12-sided die for that reason. No one else was using it. It carried no history or bias with it. It was free to be molded into something powerful. Thus, the Power of 12. Each Foci or Modus Operandi is itself a unique and empowering descriptor. In Of Gods and Relics you have nine to choose from. That’s right. Your four stats don’t even have to be the same as the character next to you at the table. Any given Focus has a value: 1 to 6. That is how many D12s you roll. 7 or higher, is a success. The enemy rolls against you. If you are attacking and get more successes, your target takes damage. What if your “stats” were Courage, Honor, Ancestry, and Joy? As a Vendai Warrior, your ability to defend your comrades and right the wrongs of the world is not based on your physical strength and sword skill. It is based on your Courage. As it should be. Now you can play a muscle bound Conan-like character or a smallish man of meager beginnings. Either way, your Courage is what you fight with. Your Honor is what holds you up against the storm of evil. Your Ancestry steadies you against the blows of your enemies. Your Joy – or love of Joy, or hope for Joy – drives you to glory or treasure. Words or weapons, it all works the same. In other role playing games, that is hyperbole and completely beside the real action which is to swing your sword and hope you hit. In the Power of 12 Role-playing System, that killer line IS your action. if you get more success than the enemy, HE takes damage. He was struck by the power of your words. We have all seen it. Maximus, Conan, Gowron, William Wallace… they have all turned the tide of battle with words. Now you can too. Deniable Asset has Modus Operandi that are more fixed: Blunt Instrument, Investigator, Infiltrator, and Technician. Those are your “stats.” Those are the empowering descriptors that, each time you look at your character sheet, you see an answer to the desperate situation at hand. And there is equipment: Relics and followers for fantasy, gear and support team members for espionage. You collect them, use them, add them to your dice rolls. They have Foci and Modus Operandi. They have personality and meaning. Describe how they help you, roll your dice, have your fun. Empower yourself with 12-sided dice. I hope to illustrate the flexibility and fun gameplay promoted by Deniable Asset. 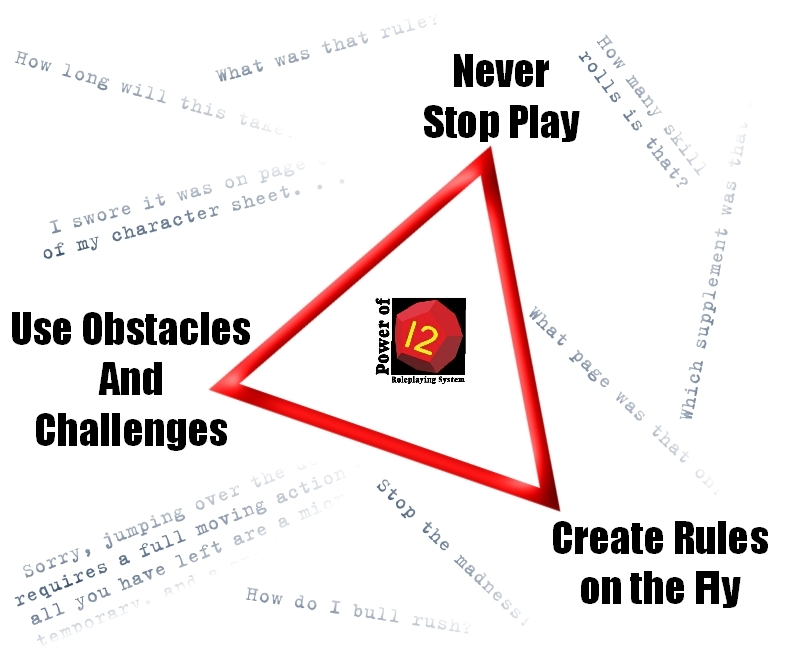 By using Obstacles and Challenges, creating rules on the fly, and never stopping play, we had a great time! Those of you not familiar with the game, feel free to grab the free download “Deniable Asset: Hiding in the Mosque” from drivethruprg.com. It gives you the basics and has the introductory mission that starts the characters off. Our action begins with the first Scenario of Hiding in the Mosque. Antoinette is a new Agent after all and the players told me they looked forward to the opening of Hiding in the Mosque and insisted that all new Agents go through that. Since we have some experienced Agents, they get to play the roles of the NPCs in that opening Scenario. This, oddly, goes much more smoothly then when the group went through this scenario the first time. Must be the presence of character Agents. Oh, and Imelda wasn’t playing. She had a lot of fun the first time. I had no idea that the electrical cord of a toaster could be used as a weapon. Afterwards the players invent the Hospitality Supply Company as a cover for the Bureau to supply equipment to the Agents. They drive there in cars they acquired during Hiding in the Mosque. At this time I award two character points. Most of the players had gone through Hiding in the Mosque previously and the game really takes off once each Agent has a piece of Gear and/or a Support Team member. We’ll cover Conrad’s Gear and Support Team Member in detail. Conrad chooses a lighter and gives it the MO, “Never Runs Dry.” It would play an interesting and creative part during the first Scenario of Executive Copier. A lighter? Yes, a lighter. 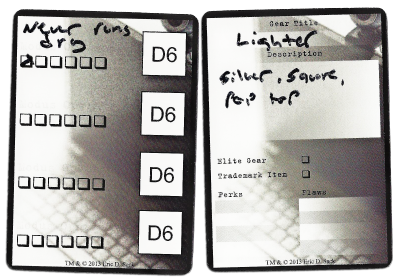 Of course, now I have to add a lighter to my next set of Gear cards. Conrad also brings Nadia, a Support Team member he developed from Hiding in the Mosque. She was a competing agent (that we invented during that mission) that he turned through seduction (very Bond-esque). Oh, the people she worked for will come looking for her. That will come when Conrad least expects it! A number of unique things happen during the first Scenario at the abandoned warehouse. After silently approaching the warehouse and breaking into the front office area, they realize there are a number of bad guys on both levels of the warehouse (on the floor and on the catwalk). The players want to enter the warehouse and spread out in hidden positions. I describe the warehouse as a large, open, two story building with rickety shelves – reaching 1 1/2 stories tall – sparsely filled with crates and boxes. Plenty of partially obscuring cover. I assign an obstacle of 2 to that effort. Each Agent would have to roll their MO against that value. Two or better, and they would get in position. Less than two success and they would not only be discovered but suffer the difference in damage. They each took up positions and rolled. All were successful. I expected that. We are rolling dice, but the odds were in their favor. I decided on an obstacle of 2 because the guards are named “Inept Guards” for a reason. Ramone’s player had to leave at this point (real life commitment) so he is called away on a side mission by Lusya, the Cell Coordinator. From there I had everyone roll for initiative. Action was about to happen. That’s how it fell out. Dimitri asks just how rickety the shelves were. I say “very rickety.” He then announces he wants to push them over like dominos in hopes of taking out a few guards at once. I decide that, with the guards wandering around, however many successes he rolls he “attacks” that many guards with the domino falling shelves and that each guard will also have to defend against that many successes. So, the better he rolls, the more shelves he topples over, the more guards he will catch in the confusion, and the more potential damage he will do to each one. He rolls 5 successes. He smiles. Five guards are caught in the mess, each defends separately, and each takes some damage. I allow the other Agents to maintain their “hiding” by making an MO roll against an obstacle 3 – it is getting more difficult to stay hidden now that action has started. Antoinette decides to stay hidden as long as possible. Safety in the shadows? Conrad faces off against several guards on the catwalks while Hans works his way to the other end of the warehouse where the goods are piled up on a pallet. Rashid, the leader of the Inept Guards is trying to maintain order and figure out what just happened. Dimitri’s next move is to leap on the shelves he had just pushed over, run along them as they falll and kick Rashid in the chest. We compress time a bit so he can do all this in one smooth action. I loved the idea. He rolls his MO to attack Rashid. If he rolls poorly, I can describe all sorts of badness that might happen along the way. If Rashid rolls well he might see Dimitri speeding along the shelves and fire his gun or leap for cover. As it is Dimitri rolls quite well again and pulls off the amazing and fun stunt with panache! By this time Hans is at that end and able to step from behind cover to fire at Rashid. You can see he picked up a Perk from defeating Rashid in the warehouse. His term is more direct, but I will call it here, “Cajoling and Deceitful.” This is worth one extra D12 if it can be at least loosely used in a MO roll. Meanwhile Conrad and Nadia (his Support Team member) are up on the catwalk. Nadia has Conrad’s gun (a piece of Gear) and fires while Conrad uses fisticuffs to waylay Inept Guards. Nadia and the Gun are part of Conrad as a character so they add their dice to his. But they are be narrated separately, allowing for more fun and action. Conrad decides to muscle one guard off the catwalk and throw him onto the lower floor. Conrad describes his action, rolls his dice, the Inept Guard rolls fewer successes, takes the difference in damage, and is sent over! There is no extra falling damage. The damage he takes from Conrad’s dice roll IS the falling damage. Conrad narrated his actions, and that led to the resulting interpretation of the damage he took. In the next round Conrad pulls out his Lighter (it has an MO value of one) and tosses it at another Inept Guard as a distraction, then performs a roundhouse kick – attempting to knock him off the catwalk as well. In this case Conrad rolls poorly and the inept guard dodges Nadia’s bullet – Nadia is still firing in support of Conrad – as well as Conrad’s kick. But a lighter with a flame that “never runs dry” is too good to pass up. So, I decide that this Inept Guard was strapped with explosives – a suicide vest if you will. But, lacking sophisticated detonators, it is set off by a simple fuse – one that Conrad’s well placed lighter just lit! No damage was done but a GREAT opportunity for narrative and drama. Conrad now has to diffuse that bomb – which he does in subsequent rounds – but his decision to have a lighter as a piece of gear, naming the MO “Never Runs Dry”, and using it so prominently creates wonderful opportunity. Dimitri and Hans work Rashid into a pickle and demand he tell his men to give up. That is an attack that Dimitri makes against Rashid and succeeds. Rashid takes damage from that “demand” like any other attack. I judge that Rashid would rather live – he has children to feed – so he gives the order. I roll for him, I roll for each guard. Those who fall short give up or run away. Those who do not get angry and fire at Rashid! The traitor! My call – anyone else running this game could have made lots of other decisions. That was mine. Those are just some of the examples from the play session that I believe show the ease and flexibility of Deniable Asset and the Power of 12 Role-Playing System. In the next warehouse there may not be rickety shelves or Inept Guards. The situation will be quite different and the Agents approach will be equally different. And they will try something new and different that there are not specific rules for. But by using Obstacles, keeping the focus of the conflict between the Agents and the NPCs, encouraging the players to play Secret Agents rather than a rule set, wonderful things occur! I would love to hear how your play sessions go. Post them in this forum or e-mail them to me. Contact information is on my site at www.randomencounters.net. 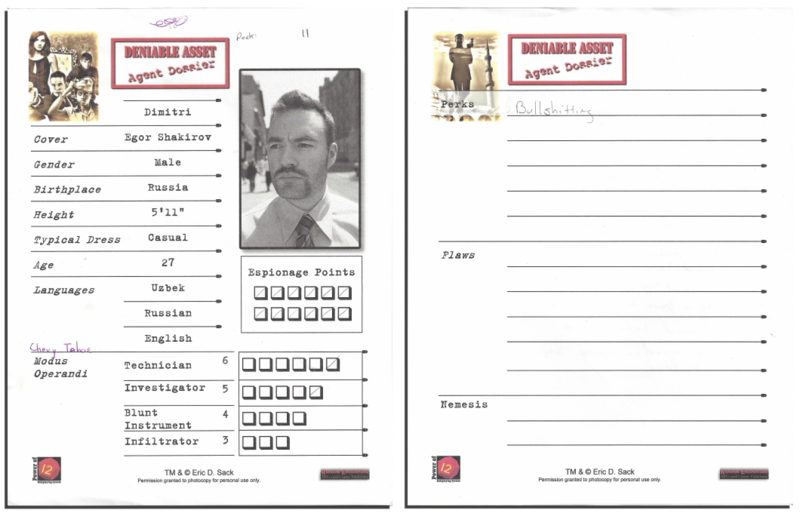 Agent Dossier now up on our Drivethrurpg storefront! 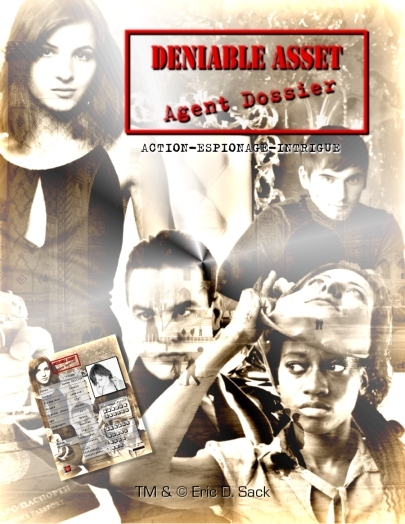 Deniable Asset: Agent Dossier has been uploaded to my publisher page on Drivethrurpg.com. Just click here to go there now. It is a free download. 20 dossiers that represent all the Agents from Deniable Asset: Hiding in the Mosque and a blank dossier for recruiting your own agent – in both “nice to look at” and “easy on the printer” formats. Of course, permission is granted to photo copy – or print extra copies – for your personal use. The Agency does not approve of non-personal use. This is a prelude to the upcoming mission, Red Herring. Red Herring picks up where Executive Copier left off. As much as any espionage mission picks up where the previous one left off. Oh there are tie-ins and an undercurrent of white lies. The first Scenario gives the Agents a nice high level overview of the mission. A view from 35,000 feet as it were. And that will be their exact altitude when the proverbial waste hits the jet stream. Good luck with that. I love working on espionage. Executive Copier let me get my feet wet. I developed a screen play style of presentation and a certain visual aesthetic that I liked. Red Herring should take that a step further. It is also encouraging me to develop the deeper, connected layers of the espionage world. Just who is behind what, who is paying who, and the all important why. It is a spider’s web, a cavernous plot spawning endless sub-plots. It all seems to spiral out of control. And yet, at the source, there may only be a few players directing this huge production on a stage the size of the world. But the actors have much latitude and their methods are circuitous at best. It’s anyone’s guess if what was intended is ultimately what gets accomplished. If you start at one end you would never find your way to the other. Best to leap into the middle. I also love the stories of the NPC agents. Many of those may never make their way into print – behind the scenes, before the Agents come along, and their “where are they now” futures. If they get a future. Here’s hoping we all get a future… in the next mission. 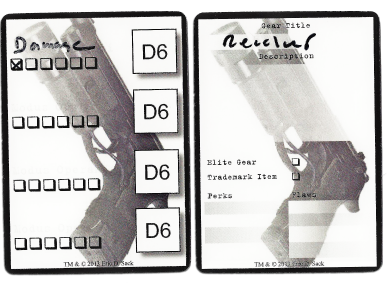 Deniable Asset Agent Accessory Cards! An anonymous source close to the president has indicated the the government is “concerned” about developments in Central Asia and is considering what our involvement should be. Further intelligence sources indicate that there is a new release from Random Encounters for their Deniable Asset espionage RPG! The sources are hush-hush on this top secret matter, but from what we have gleaned from other sources the new product is designed to enhance the player experience by providing an Agent and Espionage tracking system. At this time we do not know the technology used nor if there are nuclear weapons involved. Check the top secret link above for more detail. Deniable Asset Wins ENnies Judge’s Spotlight Award! Deniable Asset Wins a Covert… we mean coveted… ENNIES Judge’s Spotlight award! As an operative of a top secret organization, anonymity is key. It is very hard to manipulate stock prices, topple third-world governments, and influence the course of history from the shadows when someone shines the light of day on your entire operation. We will find out who is responsible for this. And when we do… well… you will never hear from us again. Or them. Mwu-ha-ha-ha! Not that we don’t appreciate the award. Quite the opposite. It will go on our top secret wall of accomplishments that no one will see… except those of you brave enough to take up the mantle of Agent in Deniable Asset!